If you are a parent, then you know how essential strollers are. Strollers allow you to take your baby places so that you don't have to leave them with a babysitter. Some women go for jogs with their babies in strollers, while others simply go for walks. Although most children are entertained by all the new sights and sounds, some may get bored in a stroller. If your child is needing some entertainment when riding in the stroller, you may want to add some stroller toys. There are so many fun stroller toys available that are safe and fun for children. Today, let's take a look at the best stroller toys for your little one. Before you begin shopping for stroller toys, you must know what you should look for. The first main feature that you want to look for is stuffed animals. Many of the infant baby toys below feature stuffed animals. Babies love stuffed animals, as they are soft to cuddle with. If possible, look for stuffed animals with teethers on them. That way, if your child starts chewing on the toy, he or she won't harm the toy. If the stuffed animals do not have a teether on them, then look for a separate teether piece. If the stroller toy doesn't come with one, you should be able to attach one onto it. This is an essential feature that will help ease your baby's discomfort when he or she is teething. Lastly, look for stroller toys that play music. Music isn't essential, but it can be entertaining. Many studies have also shown that there are benefits of having young children listen to music. Consider if you want a music player that automatically shuts off or one that needs to be manually turned off. Consider what type of stroller you have. Does it have a canopy? Will you have to snap the stroller toys onto the sides of the stroller? By figuring out how your stroller is designed, you'll be able to decide what kind of stroller toys you need. You want to make sure your stroller toys are safe for your little one. Most will be since they are designed for infants. However, you'll still want to check to make sure they are safe. It is recommended to buy BPA stroller toys. Because your child will most likely be sucking on these toys, it is important that there aren't any toxins your child may swallow. Consider if you want the stroller toys to be machine washable. Usually, only the stuffed animals are machine washable. However, sometimes there are other toys on the stroller bar that can be thrown in the washing machine too. The O Ball Flex 'N Go Activity Arch Take-Along Toy is a stroller must-have. It includes an O ball, a lion rattle, an elephant rattle, and linky loops. The linky loops are for attaching additional toys. These stroller toys are safe for children 0 months old and up. You can also attach this activity arch to car seats for when you are driving. You can buy it on Amazon by clicking below. This stroller toy attaches to most strollers, infant carriers, and car seats with the sturdy plastic clamp. This product introduces your baby to color graphics for early visual and multi-sensory development. The three reversible cards display black and white graphics on one side and have color images on the other. This stroller toy is recommended for ages 0 to 5 months. Check it out on Amazon below. The Tiny Love Take-Along Arch features a flexible arch with an angle adjustment. Because it has an angle adjustment, this stroller toy is always easy for your baby to reach. As your baby grows, the toys are great for practicing hand-eye coordination. At first, babies will randomly bat the toys causing them to sway. As they grow, they'll gradually learn to control their hands and manage to bat the toys deliberately. These baby stroller toys come in many different shapes and colors. A nice feature is a teether, which can provide comfort for children who are teething. Overall, these are great stroller toys, and can also be used as car seat toys. Click below to find this toy on Amazon. 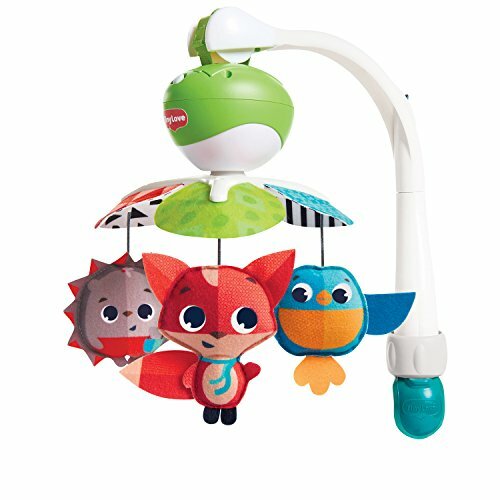 Looking for a toy that your baby can play with even when he/she is out of the stroller? If so, these Skip Hop Bandana Buddies may be exactly what you're looking for. They have a clip on them so that you can clip them onto a bar. Once on the bar, you can clip it onto your stroller. The teething toy is a nice feature. This product is PVC-free and Phthalate-free. Learn more about this adorable toy on Amazon. A soft baby toy and teether filled with textures, patterns and sounds! Little hands stay active as baby explores rattles, crinkles and more. Bandana Buddies are the perfect infant toy for multi-sensory play, this cute companion is ideal for fun at home or-on-the-go. 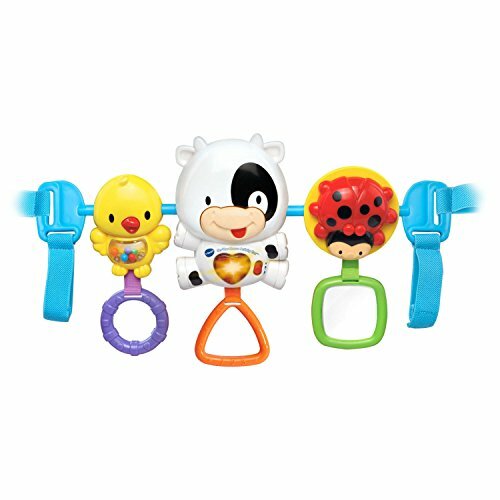 These baby ring toys are fun, colorful, and perfect for infants. 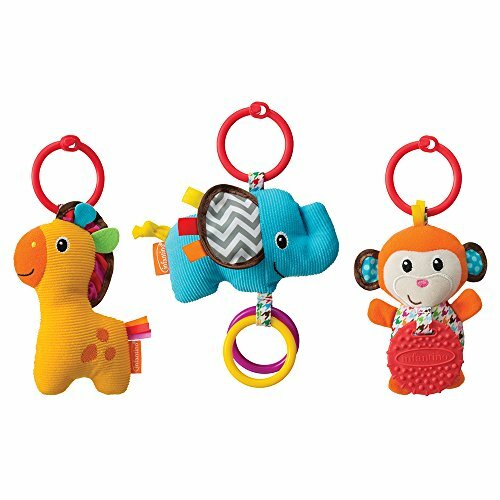 The soft elephant features click-clack rings, the monkey has a teether, and the giraffe encourages batting and grabbing. They are machine washable, which makes them easy to clean. 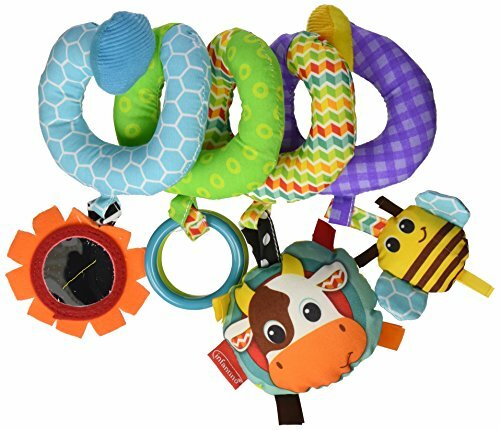 Check out these stroller toys on Amazon! This stroller toy can easily be clipped onto the canopy of your stroller. It features 30 minutes of uninterrupted music and has 5 different engaging melodies. 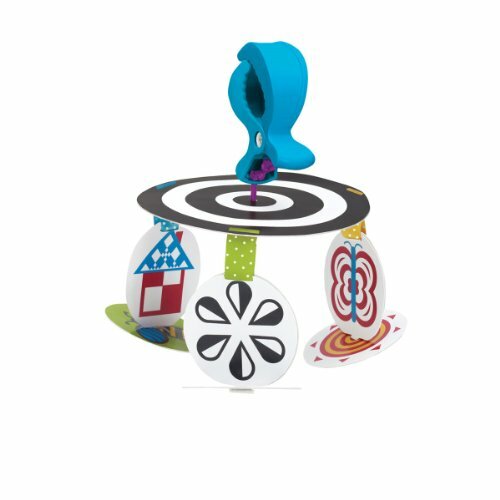 The spinning toys will visually stimulate and delight your baby. This toy is recommended for children aged 0 to 6 months old. This play mobile can also be attached to cribs, play yards, and car seats. You can find out more about this toy below. FUN AT HOME AND ON THE GO: Take-Along Mobile lets you take the fun anywhere! EASY ATTACHMENT: Goes wherever baby goes. Use on cribs, play yards, carriers, strollers, bassinets and more. This stroller toy is very easy to attach to the stroller. 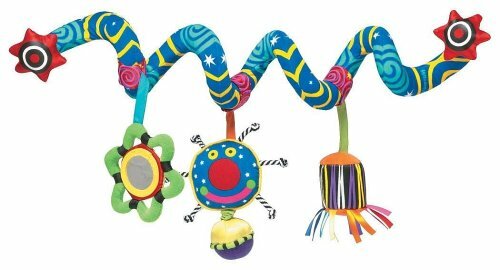 Simply wrap this plush Twirly Whirly stalk around the stroller bar. Featuring teethers, crinkle sounds, a rattle, squeaker, and textured fabrics, this toy will surely entertain your baby. This product is BPA-free. Babies 0 months old and up can use this stroller toy. Check out the PlayGro Amazing Garden below! Your baby will never be bored in the stroller with this toy around. The spiral shape attaches easily to strollers, cribs, and car seats. It is a great on-the-go travel toy, as it attaches easily by wrapping it around most anything. 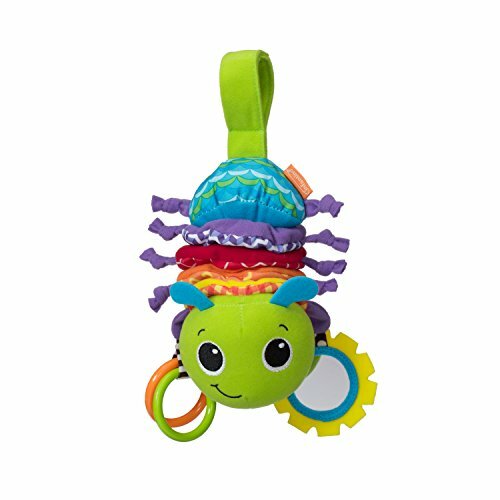 This stroller toy features soft attachments that squeak, crinkle, and rattle. This toy is perfect for children aged 0-18 months old. Click below to view this product on Amazon. 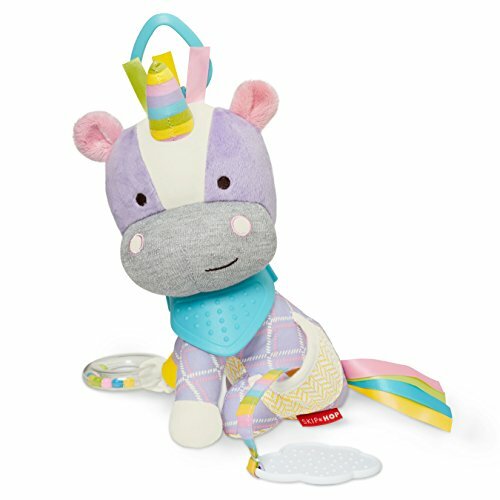 From Manhattan Toy's award winning Whoozit collection - Baby's Favorite Friend! Of all the stroller toys in this article, this one may be the most fun and entertaining. All you do is pull down on it, and it will play music and swing back and forth. This giraffe plays music for 90 seconds. Meanwhile, it slowly shrinks back to its original size. This product is BPA-free. You can find out more about it by checking it out below. 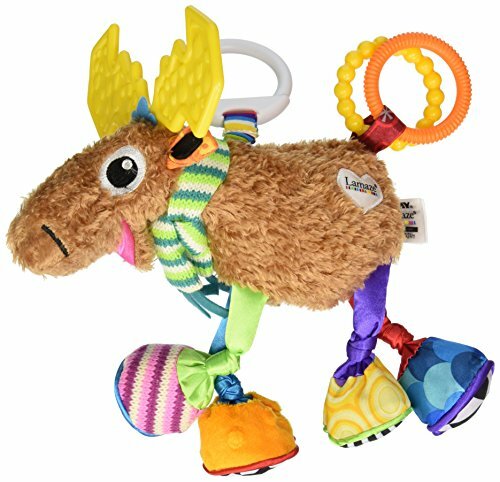 Lamaze Mortimer The Moose features soft teething antlers that will soothe your baby. The knotty activity legs and crinkle hooves stimulate tactile senses. This Mortimer has a squeaker tummy that stimulates auditory awareness and keeps your baby entertained. This stroller toy features a multi-purpose clip that connects to strollers and diaper bags. You can find this adorable and cuddly toy on Amazon by clicking below! 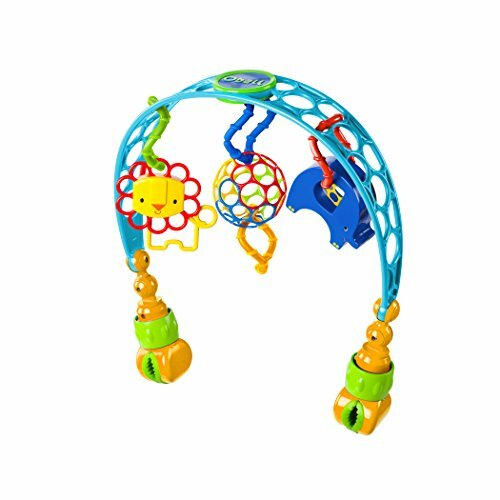 The Infantino Spiral Activity Toy easily wraps around most strollers. This product encourages important sensory milestones including gross motor skill development, as well as visual tracking. It is BPA-free. This product is perfect for babies 0 to 12 months old. Check it out below! This activity bar is entertaining for young children. You can press the cow's button to hear cheerful phrases and playful songs and melodies. There are over 45 songs, melodies, sounds, and phrases. Swing the cow back and forth to activate the motion sensor and hear interesting sounds. The bird holds a textured ring that's easy to grab to build motor skills. The ladybug's baby-safe mirror helps to build self-awareness with peek-a-boo fun. This fun activity bar attaches to most infant carriers and strollers using the included adjustable elastic straps. This product requires 2 AAA batteries. It is intended for babies from birth to 3 years of age. Check this product out on Amazon. 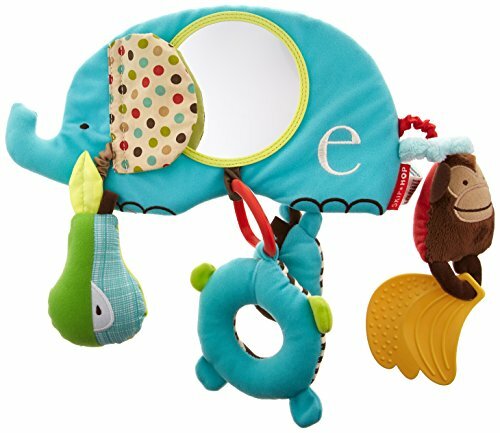 This product includes a banana teether and mirror, as well as multiple tactile fabrics. It easily attaches with adjustable straps to an infant carrier handle or a closed stroller bar. This has been safety-tested to meet or exceed ASTM, CPSIA, EN71, and applicable safety standards. It is BPA-free, PVC-free, and Phthalate-free. Find out more about it by clicking below! 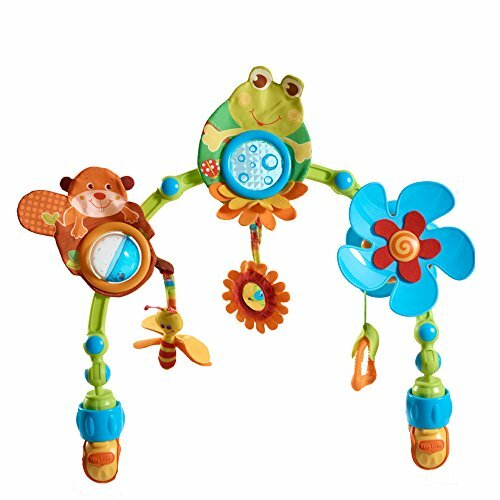 There are so many fun and adorable stroller toys that are entertaining for young children. Some of them are plush toys, while others are teethers and metal rings. These stroller toys are perfect for days when you are taking a walk with your little one. They help build sensory skills, and they are fun to play with. I hope this article has answered all your questions about stroller toys. Have fun picking out a stroller toy for your little one!